Эрнст Хейнкель успешно трудился в должности главного конструктора компаний "Albatros", "Hansa und Brandenburg" и "Caspar", a 1 декабря 1922 года он основал в Варнемюнде собственную фирму "Ernst Heinkel Flugzeugwerke AG". Первым самолетом фирмы стал двухпоплавковый ДальшеMore>>> гидросамолет-низкоплан Heinkel HE 1, выполнивший первый полет в 1923 году. На этом моноплане (HE, Heinkel Eindecker) ставились разные моторы мощностью порядка 250 л. с. (186 кВт), например, такой как 240-сильный Siddeley Puma. Чтобы обойти международный запрет на оснащение германских самолетов моторами мощностью более 60 л. с. (45 кВт), HE 1 собирался в Швеции компанией "Svenska Aero AB" - в ВМС Швеции машины обозначались S1. Улучшенный вариант с крылом большего размаха и мотором Rolls-Royce Eagle IX мощностью 360 л. с. (268 кВт) эксплуатировался в Швеции (вариант S2) и в Финляндии. 25 августа 1924 года на самолете компании "Heinkel" был установлен первый мировой рекорд - высота 5690 м достигнута с грузом массой 250 кг. Схожий с HE 2, но оснащенный 360-сильным (268 кВт) мотором Rolls-Royce Eagle IX, самолет HE 4 выполнил первый полет в 1926 году, он стал переходным вариантом к новой машине HE 5 с мотором Napier Lion мощностью 450 л. с. (336 кВт). В июле 1926 года в Варнемюнде на этой машине установили мировой рекорд скорости набора высоты 4492 м с грузом массой 1000 кг. В 1927 году появился самолет HE 8 с мотором Armstrong Siddeley Jaguar мощностью 450 л. с. (336 кВт); 22 таких самолета поставили ВМС Дании, 16 из них построила по лицензии компания "Orlogsvaerftet". Несколько машин продолжало летать в апреле 1940 года, последний экземпляр был собран в 1938 году. Самолет HE 31 - это модернизация HE 8 с мотором Packard мощностью 800 л. с. (597 кВт). В 1928 году построили 2-/3-местный гидроплан HE 9 с мотором BMW VIa в 660 л. с. (492 кВт). 21 мая 1929 года на нем были установлены несколько мировых рекордов для гидросамолетов, в том числе рекорд скорости в 231 км/ч на 500-км маршруте с грузом 1000 кг. 10 июня на самолете HE 9 установили рекорд скорости на 1000-км маршруте с грузом 1000 кг. 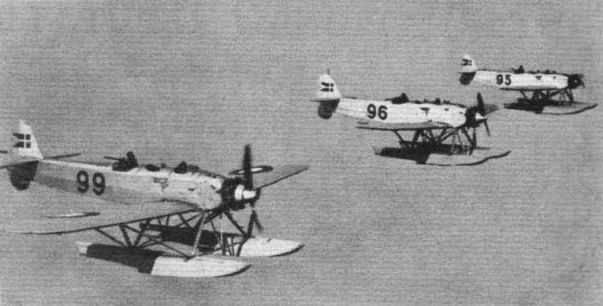 THE fact that the S.II seaplane of the Svenska Aero A.-B. 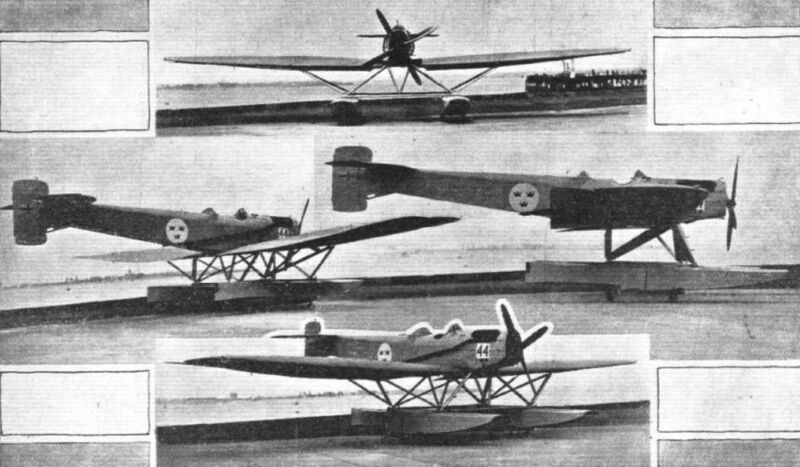 of Stockholm bears such a strong family resemblance to the famous Hansa-Brandenburg seaplanes of the war period is explained when it is pointed out that the S.II, like the Hansa-Brandenburgers, was designed by Herr Ernst Heinkel, who was once upon a. time chief designer to the latter company, and who has now established his own factory at Warnemunde. 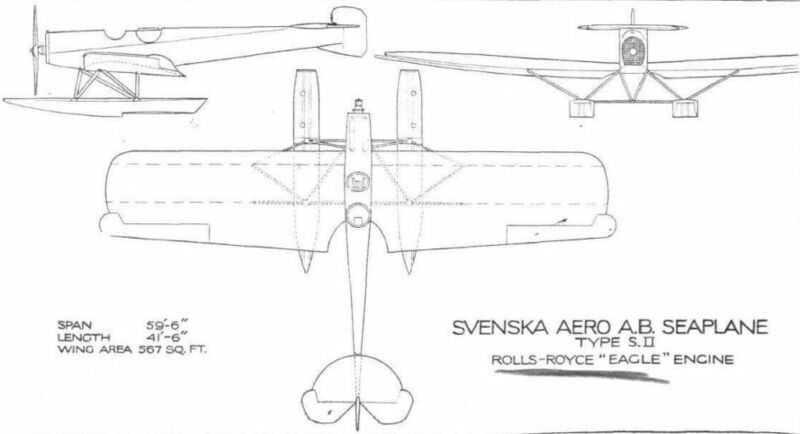 The Svenska Aero Aktie Bolaget of Stockholm builds Heinkel machines under licence. 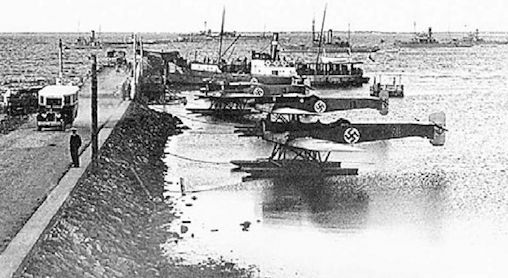 Of the same general lines as the original Hansa-Brandenburg seaplanes, the Swedish S.II differs from the prototype mainly in having a larger wing area, and, consequently, lighter loading, and in floats of larger capacity than those of the German machine. The result has been to improve not only the performance as regards get-off and climb, but also the seaworthiness of the machine, and the S.II is now considered to be a useful open-sea reconnaissance type, and is extensively employed by the Swedish air services. As a type, the machine is of the low-wing, semi-cantilever monoplane form, and it possesses the feature of a raised tail which gives the rear gunner a better field of fire. The flat-sided, flat-bottomed fuselage is of wood construction, with four longerons, transverse bulkheads and formers, and three-ply covering. In front the fuselage proper terminates in a transverse fireproof bulkhead which separates the wood construction from the all-metal engine mounting, thus reducing fire risk. The pilot occupies the front cockpit, whence his view in all directions, except downwards, is of course excellent, owing to the low placing of the wing. 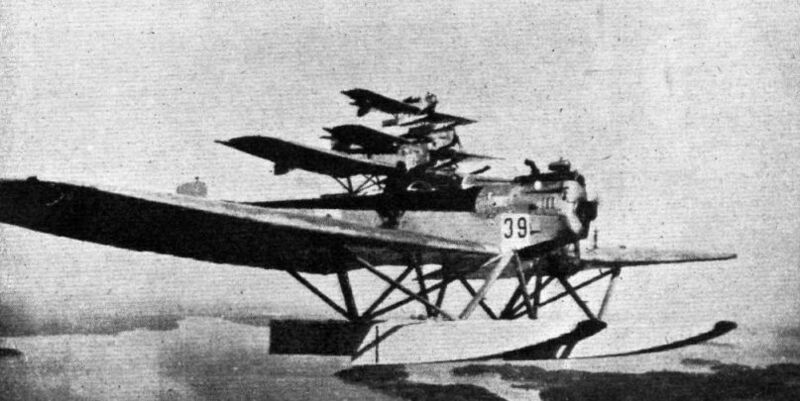 It will be seen that from the cockpit it is possible to see the noses of the floats, so that presumably taking off and alighting presents no particular difficulties. The gunner's cockpit is aft of and very close to the pilot's, so that communication is facilitated. Like the pilot, the gunner has a very unrestricted view and field of fire, and he can even look down vertically, as the trailing edge of the wings is cut away near the fuselage. The gunner's cockpit is very roomy, and contains in addition to the usual guns and ammunition, wireless equipment and a 50 cm. camera built into the fuselage to take vertical views. As already mentioned, the engine mounting is in the form of steel tubes, and forms a complete unit, attached by four conical bolts to corresponding fittings at the corners of the fireproof bulkhead. The installation is so arranged that the whole engine unit can be removed and replaced in a very short time, while for engine-test purposes, the unit can be bolted to a suitable stand and tested under conditions resembling those obtaining in the actual machine. The engine fitted is a 360 h.p. Rolls-Royce “Eagle," and the installation is partly shown in one of our photographs. The engine cowling is quickly and easily removed, when the whole of the engine unit can be inspected. 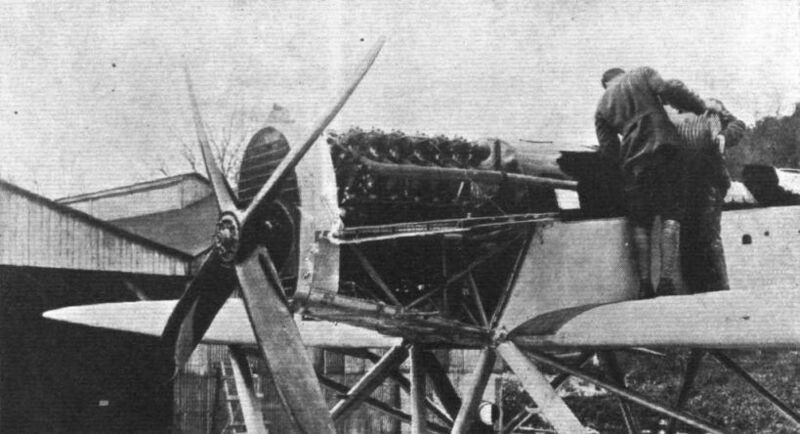 The petrol tank, which has a capacity sufficient for five hours at full throttle, is placed immediately aft of the engine bulkhead, and is, as will be seen from the photograph, replenished by men standing on the inner end of the wings. A nose radiator of usual type, fitted with shutters for varying the cooling, is provided, the propeller shaft passing through it. Constructionally, the wings are of normal type, with box spars of spruce and three-ply, spruce ribs, and fabric covering. The various compartments of the box spars are not entirely separated from one another, that is to say, the wood blocks, or partitions, are provided with openings, and the interior of the spars can, it is stated, be ventilated by means of air pumps so as to get rid of any moisture that may have collected. The internal drag bracing is in the form of steel tube drag struts and stranded cables. The wing is built in two halves, attached to the sides of the fuselage, and braced by N-struts to the floats below. It is stated that the factor of safety of the wings is 10-5, but it should be pointed out that this figure is based upon the loads in normal horizontal flight. The triangulation of the float undercarriage struts, which are weldless steel tubes with wood fairings, can be seen in the general arrangement drawings. The floats themselves are of the single-step type, and are of all-wood construction. They are covered with ply-wood and provided with several water-tight bulkheads, each compartment having its inspection door. It is stated that the float volume is such that one float will support the machine, so that sinking is practically precluded. The attachment of the floats to their struts is such that a float can be quickly removed without interfering with the undercarriage structure in general. As regards the general handling of the S.II, the machine is said to be very pleasant to fly, to get "unstuck" very easily and quickly and to land very slowly. 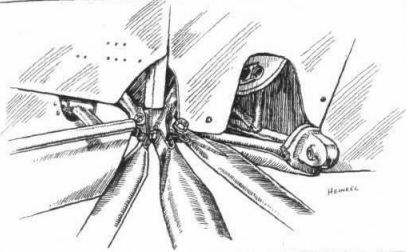 The lateral control is said to be very effective, and although a trimming tail is not fitted, the tail plane can be so adjusted that with the engine running all-out the machine becomes tail-heavy, i.e., climbs, while at cruising speed it flies horizontal and with engine throttled it goes into a glide quite automatically. In other words, the machine can be made to "fly on the throttle." The weight of the machine empty is 1,700 kgs. (3,740 lbs. ), and with petrol for five hours at full throttle, pilot, gunner, machine guns and ammunition, wireless outfit and camera, the total loaded weight is 2,450 kgs. (5,400 lbs.). The top speed is stated to be 185 km./h. (115 1/2 m.p.h. ), and the range 925 km. (575 miles). The climb to 1,000 metres (3,280 ft.) occupies 4 1/2 minutes, and to 2,000 metres (6,560 ft.) 10 minutes. No figures as to landing speed are available. The German constructor represented by the greatest number of machines in the competition is Ernst Heinkel, also a pioneer of aircraft design and construction, who has entered no less than five machines of three different types. No. 9, the H.E.5, is a low-wing monoplane, in which the wing is of the semi-cantilever type, of wood construction. The fuselage represents an innovation, as far as this designer is concerned, in that it is built up of steel tubing, with longerons and struts welded together and braced by piano wire or cables. Three seats are arranged one behind the other, but in the competition the last cockpit is covered over. The engine of No. 9 is a Napier "Lion," and the total wing area is 49 sq. m. (527 sq. ft.) and the weight empty, 1,640 kgs. (3,608 lbs.). The total loaded weight is 2,500 kgs (5,500 lbs. ), and a top speed of 207 km./hr. (129 m.p.h.) is claimed. No. 10, the Heinkel H.E.5, is similar in every respect to No. 9, but is fitted with a Gnome and Rhone "Jupiter." Its empty weight is 1,500 kgs. (3,300 lbs.) and total loaded weight l,920 kgs. (4,224 lbs.). A top speed of 200 km./hr. (125 m.p.h.) is claimed. No. 17, the Heinkel S.I, looks very similar to the Swedish-built S.I monoplane, illustrated and described in FLIGHT some months ago, and as the Swedish company is constructing Heinkel machines under licence, the "family resemblance" is not surprising. The engine with which the S.I is fitted is a Rolls-Royce "Eagle IX," but no other information is available. Dr. Ernst Heinkel is one of the pioneers of German aviation, having been actively engaged in design and construction since the earliest days of flying. 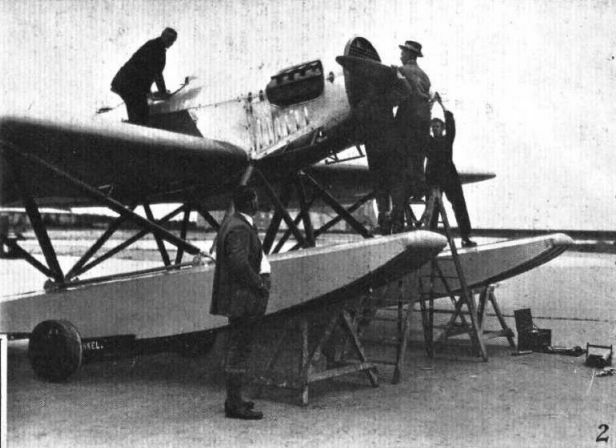 At Olympia he is exhibiting a seaplane, the type H.E.9, with B.M.W. VI engine, developing 500/750 h.p. The H.E. 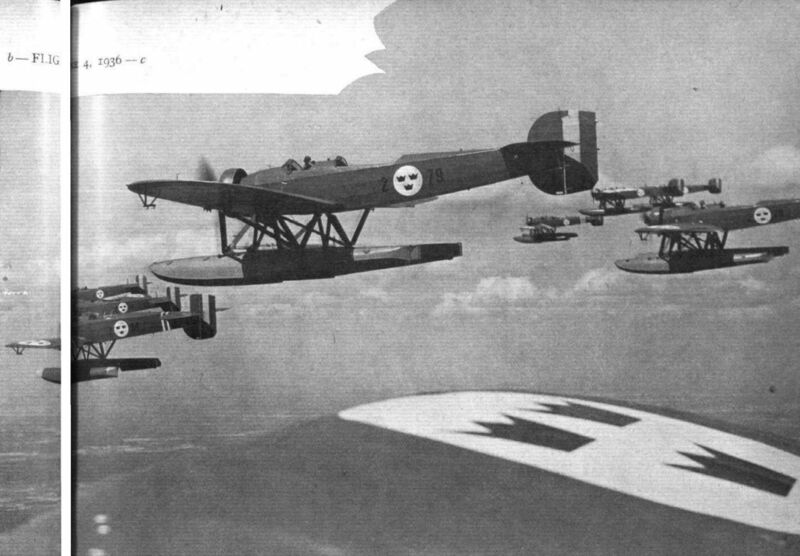 9 is of typical Heinkel design, i.e., a low-wing monoplane with twin-float seaplane undercarriage. The fuselage is a steel tube structure in which longerons and struts are joined together by welding. Bracing is by diagonal struts, welded at the ends. The covering, except in the region of the engine, is fabric. The wings are of wood construction, with box spars having spruce flanges and three-ply walls, and ribs of wood. The covering is fabric. Over the leading edge of the wings is a covering of three-ply to give stiffness, and in the inner bay the wings have their under-surface covered with three-ply to support and cover the petrol tanks housed here. The strutting supporting the floats is such as to provide also outboard bracing for the two wing-halves. Two long wooden floats support the machine on the water. The floats are of the single-step type, and have a vee bottom in front of and behind the step. They are divided by six bulkheads into seven watertight compartments. Mounted on a welded steel tube structure in the nose is the B.M.W. VI engine, which has a compression ratio of 7-5 to 1. The petrol tanks, of brass, are housed one in each wing, and supply to the engine is by pump. Between the engine and the cockpits there is a fireproof bulkhead. The aircraft controls are of normal type, with hand wheel for the rudder. The tail plane can be trimmed during flight. The main dimensions of the Heinkel H.E.9 are: Length, 11-6 m. (38-1 ft.); wing span, 16-8 m. (55 ft.); wing area, 48-5 sq. m. (522 sq. ft.). The tare weight of the machine is 2,130 kg. (4,680 lbs. ); this figures includes oil and water in engine. The normal disposable load is 870 kg. (1,915 lbs. ), giving a normal gross weight of 3,000 kg. (6,600 lbs.). The machine may, however, be overloaded to a gross weight of 3,150 kg. (6,925 lbs.). For normal gross weight the load may be made up as follows: Crew of two, 160 kg. (352 lbs. ); fuel, 350 kg. (770 lbs.). (The tanks actually have a capacity for 500 kg. (1,100 lbs.) of fuel.) Military load, 360 kg. (792 lbs.) With a gross weight of 3,000 kg. (6,600 lbs.) the performance claimed for the H.E.9 is: Top speed 250 km./h. (155 m.p.h. ); climb to 1,000 m. (3,300 ft.) in 2-8 mins. ; to 2,000 m. (6,600 ft.) in 5-9 mins. ; to 3,000 m. (10,000 ft.) in 9-5 mins. ; to 5,000 m. (16,400 ft.) in 25 mins. Actually the performance figures obtained by the DVL during type tests were in all instances slightly better than those quoted. With 350 kg. (770 lbs.) of fuel the range is 600 km. (370 miles) and with full tanks, 500 kg. (1,100 lbs. ), the range is 850 km. (525 miles). HE 1 сохранил компоновку монопланов Hansa-Brandenburg. Многие самолеты семейства HE использовались для обучения летчиков будущих Люфтваффе. 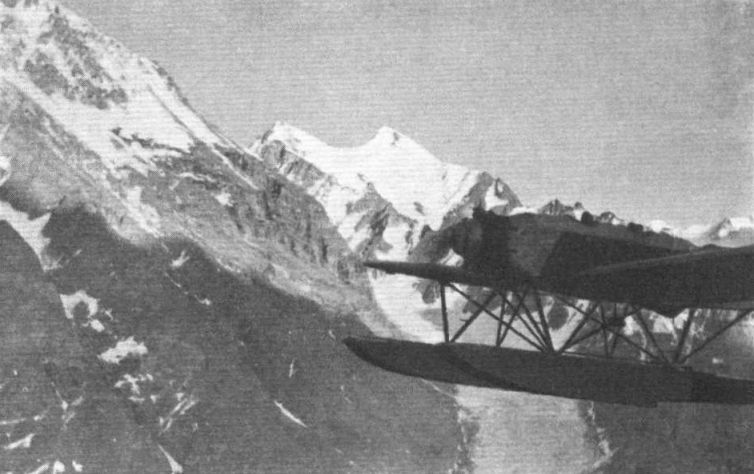 Side view of the "S.II." Nose of the "S.II," showing tubular mounting of the Rolls-Royce "Eagle" engine. 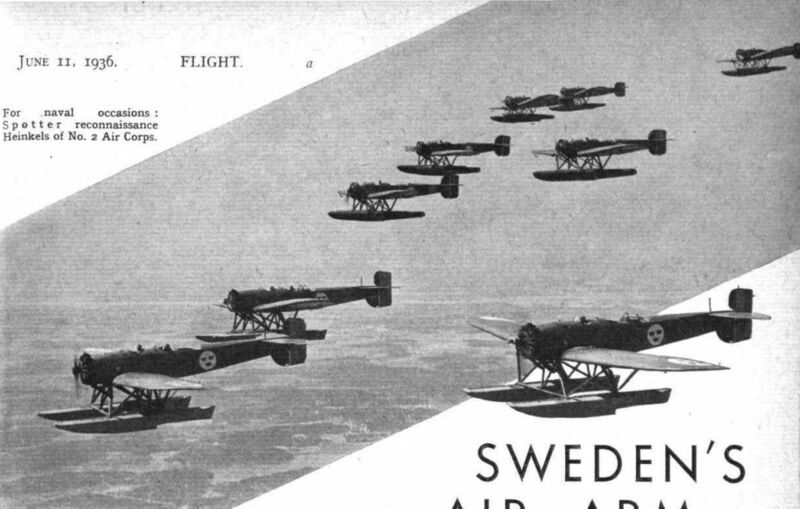 FORMATION FLYING IN SWEDEN: Our photograph shows one side of a formation of S.11 Svenska Aero A.B. 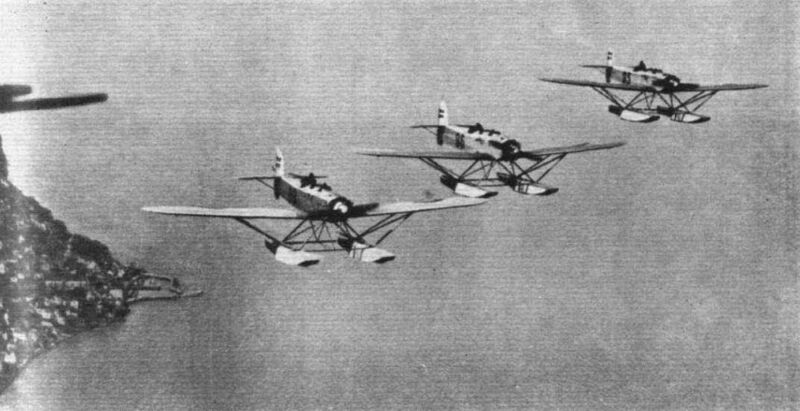 seaplanes during practice. The photograph, which was taken from the Squadron-Leader's machine, shows typical Swedish "country" below. 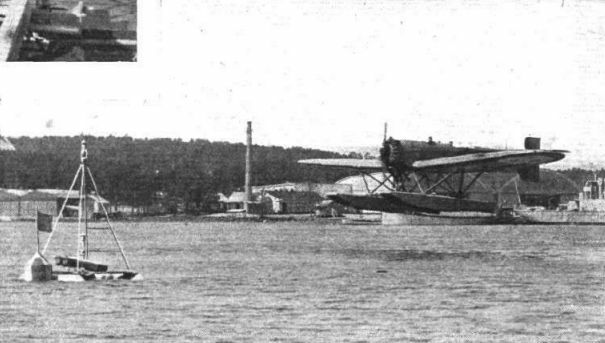 A SWEDISH VISITOR: These four photographs show the Swedish seaplane with Rolls-Royce "Eagle" IX engine, on which Commander Flory flew from Stockholm to Felixstowe and back. On the return journey the flight from Felixstowe to Malmo was made, non-stop, in 7 hrs. 15 mins. HEINKELS AT WARNEMUNDE: Ernst Heinkel, one of the pioneers of German aircraft construction, is represented by five machines. 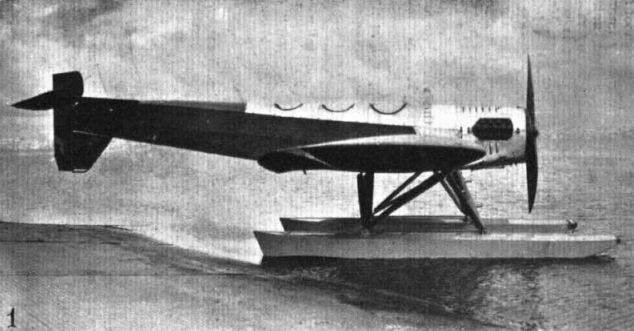 The nose and floats of the H.E.5 monoplane with Napier "Lion" engine are shown, in 2. The process of fitting with a Reed metal propeller being shown. 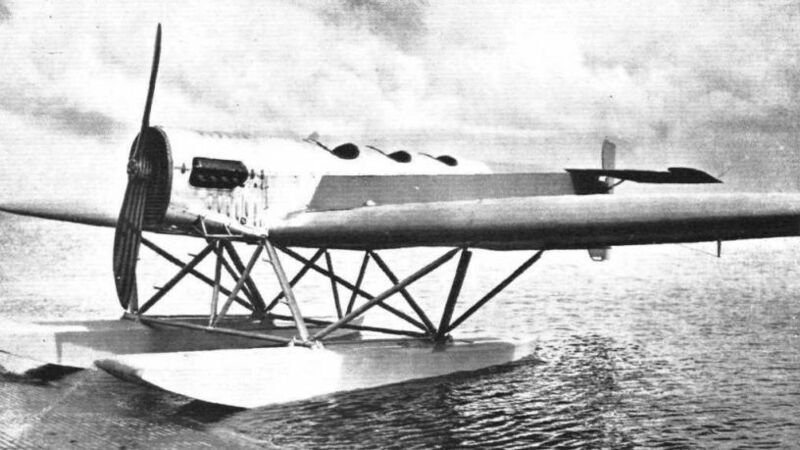 BRITISH SUCCESS IN GERMANY: First Prize in the seaplane competition, which has just been concluded at Warnemunde, was won by the Heinkel H.E.5 monoplane with Napier "Lion" engine shown in above photograph. THE BRISTOL "JUPITER" IN GERMANY: The Heinkel H.E.5 mono-seaplane fitted with a Bristol Jupiter engine. It was this type of machine which did so well in the recent Warnemunde competition, until it came to grief in the seaworthiness tests. HEINKELS AT WARNEMUNDE: Ernst Heinkel, one of the pioneers of German aircraft construction, is represented by five machines. The machine illustrated in 4 is also a type H.E.5, but is fitted with a Gnome and Rhone "Jupiter." HE 5 выпускался в нескольких вариантах с разными моторами. На фотографии - HE 5b с мотором Bristol Jupiter лицензионной постройки. ANOTHER GREENLAND AIR SURVEY: One of the Danish Heinkel seaplanes. 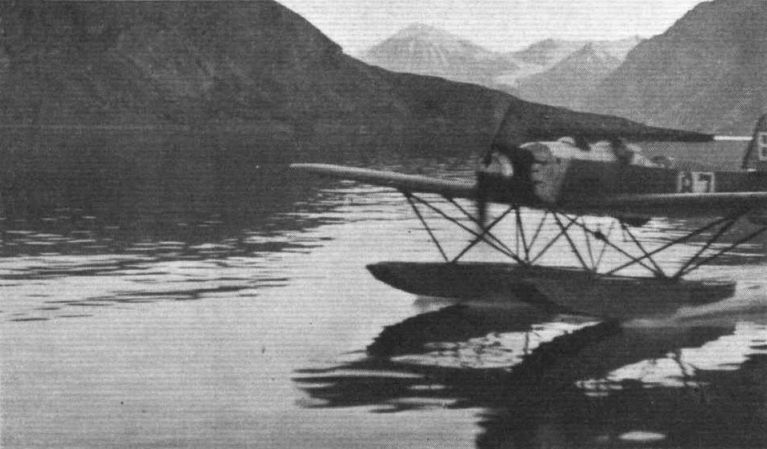 AN ANGLO-DANO-GERMAN ALLIANCE: The Heinkel ("Jaguar") taking off from a fjord. "FROM GREENLAND'S ICY MOUNTAINS...": The Siddeley "Jaguar" does not seem to mind the cold. THE HEINKEL H.E.9: Of typical Heinkel design and construction, this machine is fitted with a B.M.W.VI engine. Float struts and wing root attachments on the Heinkel H.E.9.